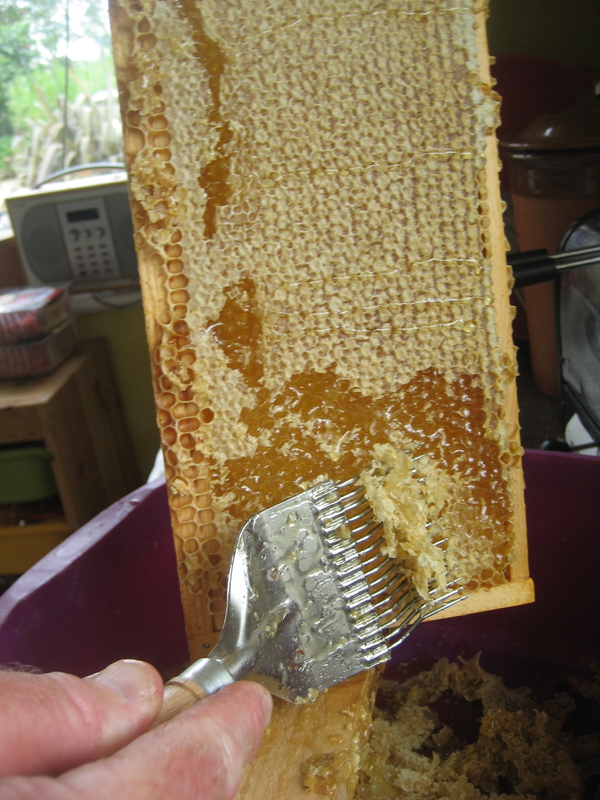 Last month Mr C helped me harvest the honey from my beehive. I had four supers on the hive. One was being ‘cleaned’ by the bees after having been extracted a month earlier. Around 30lbs of honey from that one super with ten frames,so due to the paraphernalia involved we decided to do two supers this time and leave the third for the bees to keep working on. Extracting honey isn’t just a simple case of nipping out and lifting off the super. A few days earlier you need to visit the bees and put in a board with a ‘bee escape’ on it. This allows the bees on the supers to leave them clear but prevents other bees getting into the super. When you then remove the box it should be clear of Bees. This is something that when I had Chris Bees mentoring me I obviously didn’t take it all in and luckily it was hubby who reminded me! I also wonder if I have some kind of dyslexia when it comes to gadgets, the bee escapes are a white plastic slider that screw onto your crown boards, but getting them the right way up is crucial, or you end up with a box that bees get into but can’t get out of! I was very chuffed when I selected my two supers, swapped around a few individual frames and put the crown boardbeneath them, pretty sure I had the slide doors the right way around. I then closed up the hive and we waited three days before both going out to collect them. Before collecting you need to prepare a space, we use the kitchen, ready to place the supers dripping with honey somewhere accessible. We cover the floor and work surfaces with newspaper. Fresh clean ‘bee tea towels ‘ & dishcloths all at the ready. We have a washing up bowl with a wooden ledge on it for uncapping. 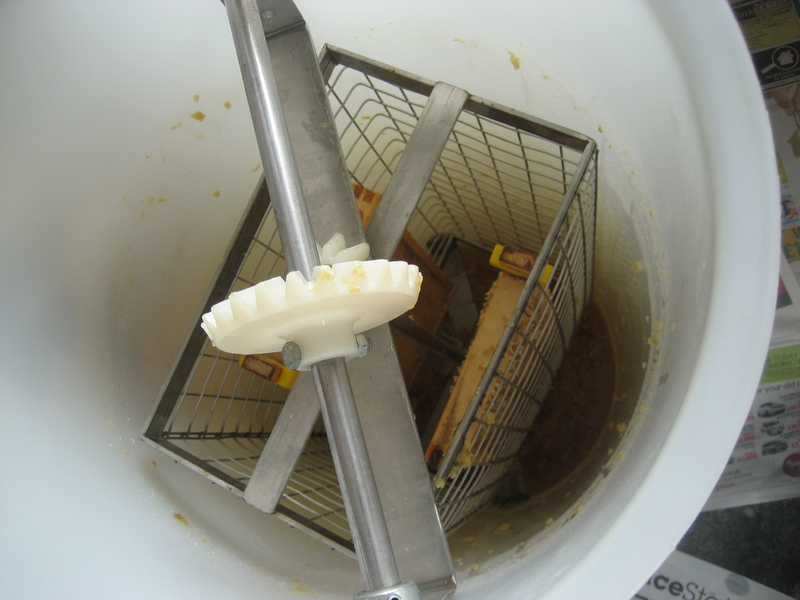 I have a two frame extracter that I managed to purchase from a retiring bee keeper last Autumn. Capping forks and sharp knives at the ready, and a glass & post card for removing stray bees. The last super we extracted came into the house with about six bees on it. The bees aren’t aggressive and can easily be removed using the glass & post card. It’s important to have doors & windows shut as the scent of the honey attracts all kinds of insects! As you can only open the hive on a dry day and its usually August this is quite a hot and sticky operation! When we opened the hive for the two boxes we were greeted by quite a few bees! Although I had put the lower crown board on the right way around, I hadn’t sealed the top so of course the bees could come and go as they please! As this was the only dry day forecast where hubby would be around to help we had to go for it! The risk of delaying could mean the bees could swarm taking most of the honey with them, or it could be victim to robbing by other bees or wasps, so we had to carry on. The supers were very heavy, about 20lb s each in weight so Mr C took them into the house, wrapped in a large cloth to prevent a dripping trail of honey. Drips can attract wasps, both to the hive and our kitchen! After closing up the remainder of the hive, whilst apologising and expressing gratitude to the girls, I returned to the house to see a healthy quantity of bees buzzing around the kitchen. Interestingly, they seem more interested in getting out, so it’s a case of collecting them off the windows and guiding them outside. Although we both still had bee suits on it was too hot to keep on the veil and gloves but these girls weren’t stinging so all was well! Earlier in the year we had happened upon a Bee Keepers auction where I was able to purchase some handy gadgets. One was a ‘Combe punch’ and pots for extracting and storing honeycomb . I set to work organising the frames, finding the natural combs and separating them from the wired combs. I had four natural combs and from them punched out sixteen portions of honeycomb and packaged them in the clear lidded pots. Meanwhile Mr C began the job of uncapping the frames ready to place them, two by two, in the extractor. From the remaining sixteen frames we extracted around 40lbs of honey in addition to the cut honeycomb. Once the frames had been uncapped spun, I returned the two supers with their empty frames back to the hive. We left one super full of honey on the hive for the bees to feed from. I have decided that this year I will not be feeding them the usual sugar fondant or syrup but their own, much healthier honey. This is going quite against the grain in current beekeeping circles, however it feels like absolute common sense to me. I have a spare pack of fondant, just in case we have a particularly long or cold winter and they run out of stores. I store most of my honey in a large bucket with a tap and over the following months, decant into jars. 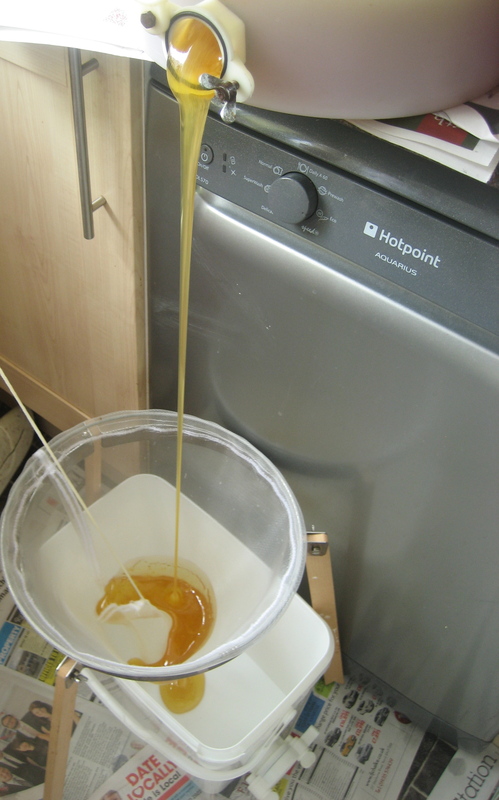 This year I planned to enter my honey into the Mid Somerset Show for the first time….